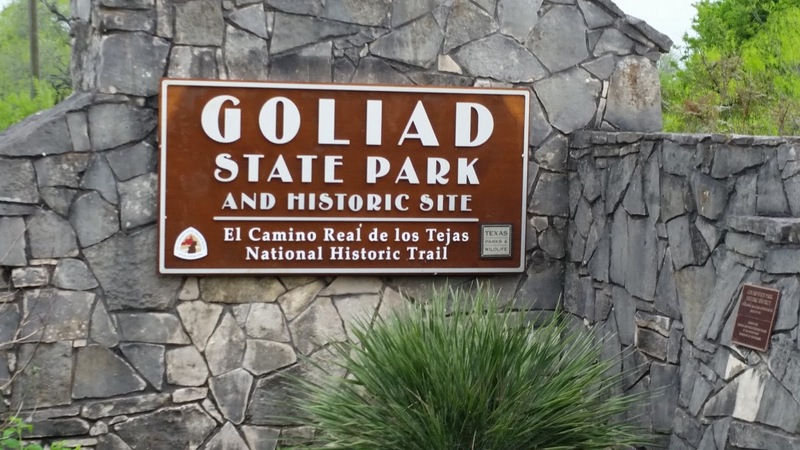 If you leave the Houston area and travel southwest down US-59 for two and a half hours you'll come to the tiny town of Goliad, TX. A few miles south of Goliad is Goliad State Park and Historic Site where I camped for a couple days in mid-March. The park lies on both sides of US-59 within a big loop the San Antonio River takes on it's way to the Gulf. 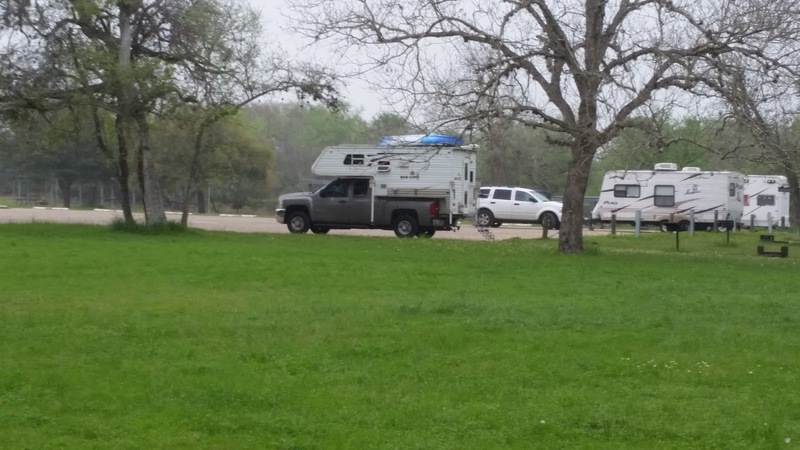 There are three tent-only campgrounds and two water-electric RV campgrounds within the park with the tent-only areas being right along the river and the RV spots being more centrally located within the park. As it was Spring Break week the park was pretty full and I was only able to secure a campsite in what I'd describe as an "overflow lot" which amounted to a gravel parking lot with hookups around the edge with the requisite fire ring and picnic table. The other RV camp area in the middle of the park was the more conventional individual pull through sites and would be much preferable. If you go try to reserve sites in that area. At least I had a corner spot in the lot. My intention upon setting up camp was to check out kayaking conditions with the possibility that my friend Becky who is an avid kayak-er would drive down from Houston with her kayak. 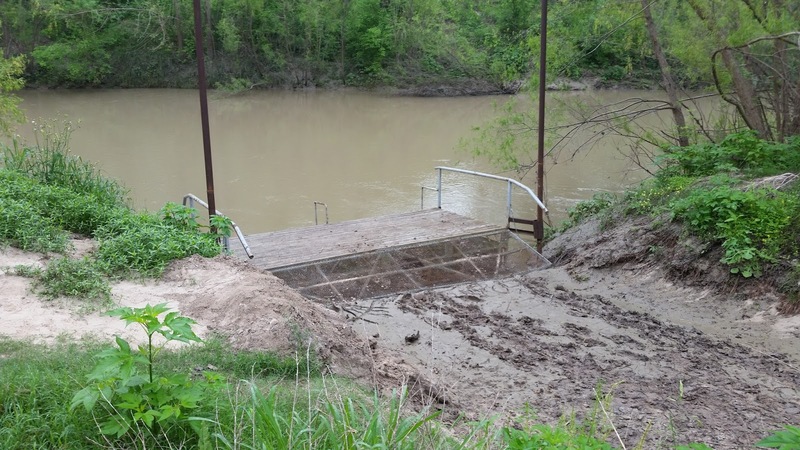 Unfortunately there had been a lot of heavy rain in the area and the kayak launch site was a muddy mess. The kayak launch site -- Mud City! 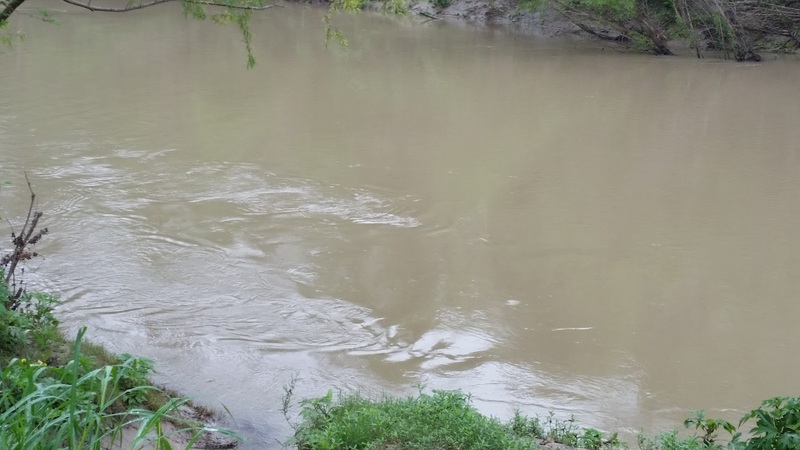 Because of all the run-off the San Antonio River wasn't the most attractive kayak venue anyway. The muddy San Antonio River, usually it's much nicer looking. 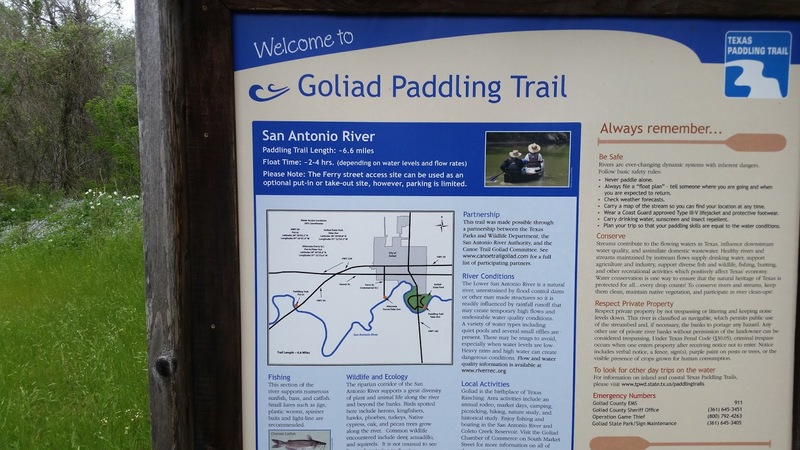 There is an official six mile paddle route that begins right in Goliad and comes through the park to end up further down river which I'd like to try sometime. 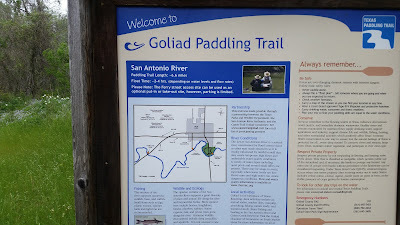 This sign announcing the Paddle Trail is within the park. 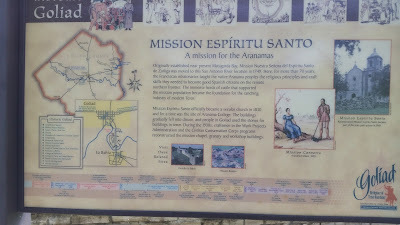 On the last day of my stay I visited the Mission Espiritu Santo historic site which is right next to the park office. 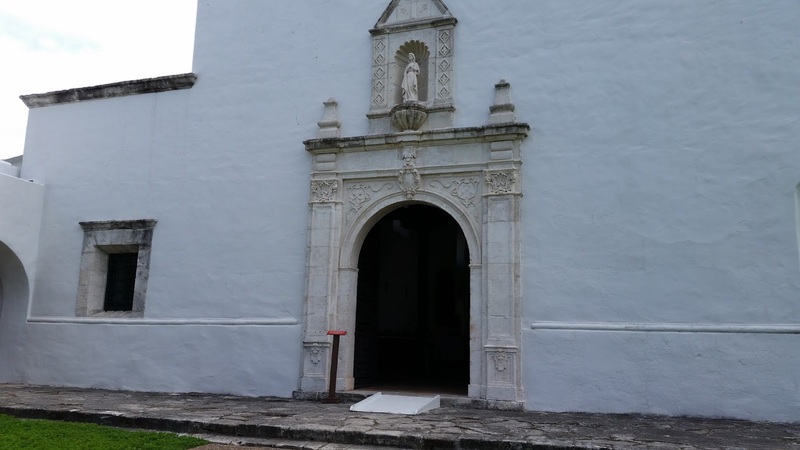 Originally set up by the Spanish in 1722 near Victoria, TX the Mission was relocated to Goliad in 1749. It's purpose was to introduce Christianity to the Aranama Indians. The front entrance into the mission. Today the mission has been reconstructed and houses a neat little museum with artifacts and displays showing what life in the mission was like for the priests and soldiers stationed there. A museum display of artifacts found in the mission area. 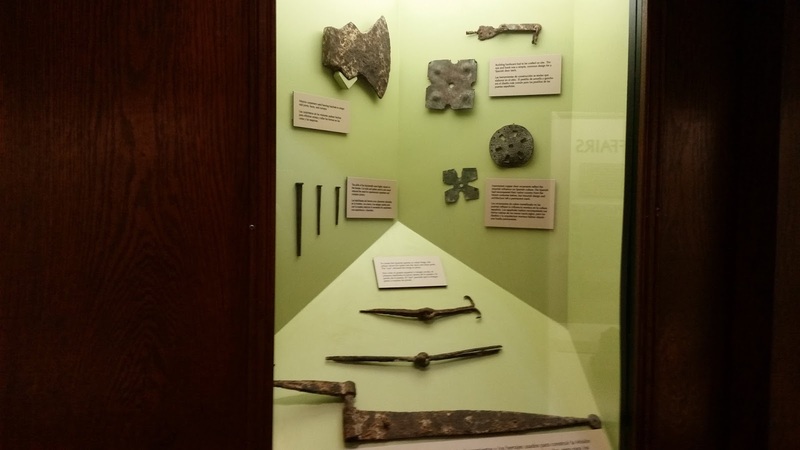 This display told the history of the mission. 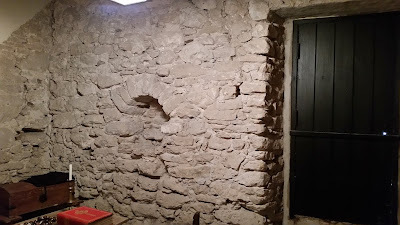 A portion of the original 250 year old walls. I love history and visiting the Mission museum was really interesting. 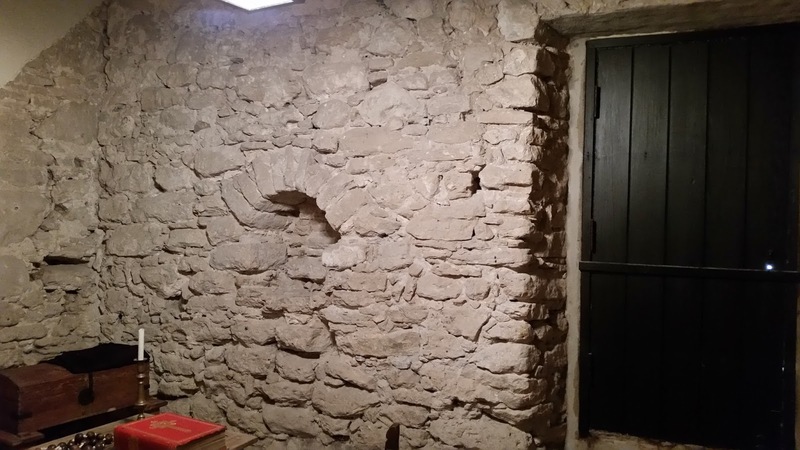 A trip to Goliad State Park is worth it if only to see the Mission historic site and museum. I wish the weather could have been a little nicer to allow kayaking but I enjoyed my stay at the park and would recommend it with the caveat of, if possible, getting into the drive-thru RV sites rather than the parking lot area.